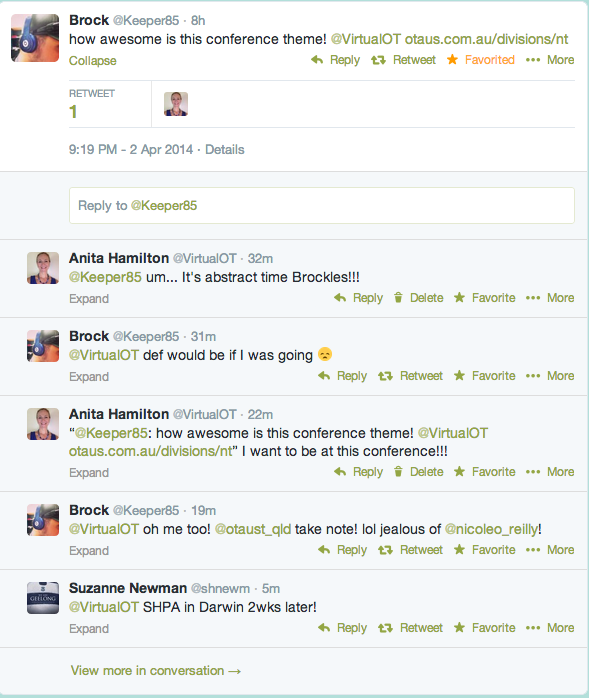 Tonight I found out from Brock via Twitter that the Northern Territory Division of OT Australia has decided that the theme for their State conference in August 2014 will be TechnOT! That is FANTASTIC news!!! After about 10 years chipping away at the edges of digital literacy in occupational therapy – along with so many virtual friends – it’s fantastic to finally see this theme front & centre at a State conference, well done NT! I am sitting here thinking about which aspect of my PhD or other work completed with colleagues and students should I propose in an abstract?? 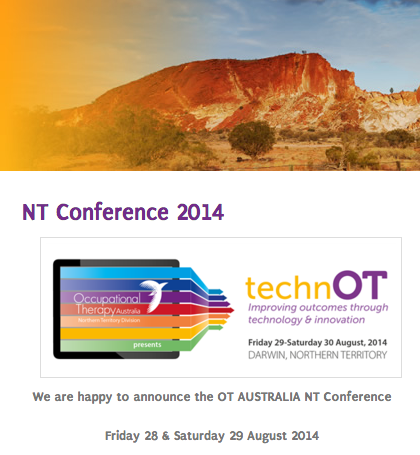 I’m also wondering which of my virtual OT colleagues might like to come to Australia in August and present with me? So many of us have collaborated over the past decade – we are a virtual team who have shared this journey at so many points it would be so fun to share this conference together! Contact me if you’re keen!! I'm not sure about flying there, but a presentation via Skype sounds like a great option for us virtual OT's in the USA!